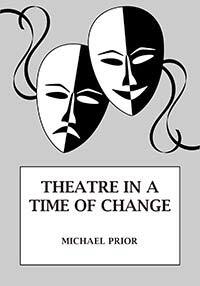 Michael Prior first had the idea for Theatre in a Time of Change some thirty years ago when writing another book on the theatre - Playwrights' Progress with Colin Chambers. He became aware that, although there was lots of books on both theatre actors, writers and so on – and on plays, there was almost nothing written on theatre itself, that is, the cultural and economic position of the art-form called theatre in the UK. Take a couple of simple questions: how many theatres were there in, say, 1950 and how many in 1960? How were these theatres financed and where were they? It was commonly recognised that in the 1950s, theatre suffered a serious decline but just how serious is seldom discussed. The facts took some digging out but it seems that at the end of the 1940s, there were some 520 theatrical venues in the UK. whilst in 1960 there were 224 outside London of which 50 were mainly used as cinemas much like the Hebden Bridge Picture House is used today plus a further 45 in London. Most of these were private commercial ventures and this sector continued to drop precipitately so that by 1970 there appear to have been more commercial theatres in London than outside; something not seen for over two hundred years. Yet in the 1970s, theatre as a cultural form was probably more vital and influential than it had ever been with touring theatre groups proliferating like apple blossom in spring. In the mid-80s, there were around 300 in existence, some with a very transitory life but still putting on some shows. The story of how this transformation came about is the centrepiece of the book. It involved in a general sense subsidy from public funds but this does little justice to the complexity of the shift. One important and often forgotten aspect was the role of local councils which played a major role in building new theatres, some 104 by the early 1970s plus several hundred new arts centres most of which had some kind of performance space. Alongside this physical infrastructure, there developed a quite new emphasis on the role of theatre as a community culture and as a way of developing particular kinds of consciousness. Groups such as the Black Theatre of Brixton, Gay Sweatshop and the Women's Theatre Group as well as political campaigning groups like Red Ladder are exemplary in this respect. There was also a new generation of people entering the theatre. One these people was Buzz Goodbody, a good friend of the author, and to whom the book is dedicated. Buzz was the first female director in the Royal Shakespeare Company and was instrumental in the opening of its first alternative venue, the Other Place, in Stratford which celebrates its 40th anniversary this year. She was also a feminist and a Communist taking part in many of the feminist demonstrations of the early 70s, and even arrested on one of them. Michael Prior told the HebWeb that it took a long time to write this book and it is inevitably bound to be overtaken by time. It cannot, for example, deal with the threats to theatre provided by the savage cuts to artistic budgets by the Coalition Government. But it does tell a story that should be remembered. Another eBook from Pennine Pens! Or the iBooks version for iPads, iPhones and Macbooks. The Bad Step by Andrew Bibby, also of Hebden Bridge. For Nick Potterton, high-flying London journalist who has moved to the Cumbrian countryside, Davie Peters' death should be just another story to cover. But the longer he investigates, the more disturbing questions he has to answer. iBooks version online now for iPads, iPhones and Macbooks.